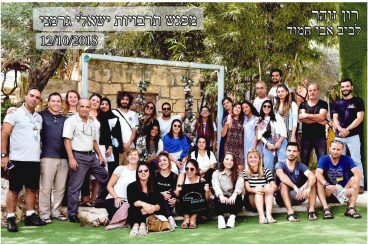 Twenty young adults from Germany and Israel met between October 8 and 14 for a first exchange program in Israel as part of the project „Living Diversity in Germany and Israel – Challenges and Perspectives for Education and Youth Exchange“. It is organized and run by ConAct – Coordination Center German-Israeli Youth Exchange and the Israeli Youth Exchange Authority in cooperation with the Multicultural Forum e.V. and the Hebrew Scouts Movement in Israel. Exchange connects people: Within seven days two separate groups from two different countries became one diverse group of young peer-to-peer educators, whose individual stories of belonging became visible, who shared a lot of common interests and then joint experiences during this exchange. 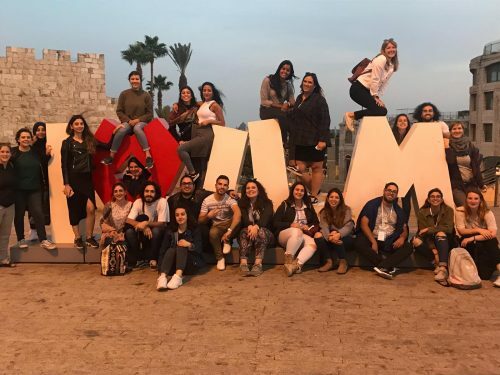 After an intensive get-to-know-each-other session in which the individual and collective identities of the participants were central, visits to Jerusalem, Tel Aviv and the small town of Schefar′am east of Haifa followed. In this town Druze, Muslim and Christian Arab Israelis live together. In addition to the simultaneous experience of Christianity and Islam through neighboring churches and mosques as well as the Muslim Friday prayers, we received the great hospitality of the Druze hosts. 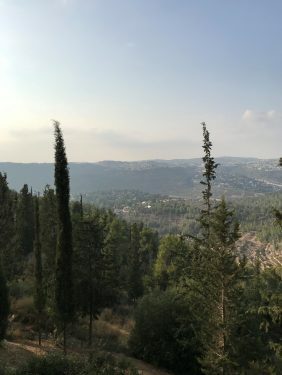 This small, self-contained community is often based in the northern periphery of Israel. Whilst its religion is known only in detail to its worshipers and adherents and the community lives its tradition and maintains its history, they stay very loyal to the State of Israel at the same time. 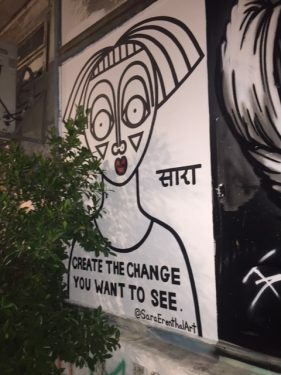 In Southern Tel Aviv, we visited projects of the Scouts that work with disadvantaged youth, trying to empower new immigrants to participate in Israeli society. Furthermore the project visits focused on how this society deals with refugees and migrant workers, i.e. when the participants of the German-Israeli youth exchange visited the Bialik Rogozin School. The school offers its students a comprehensive education, which should give them opportunities to „develop a sense of belonging to their community and to the Israeli society“*, to establish their own families and to gain work opportunities. Most of the children and adolescents come from socio-economically disadvantaged families, including Jewish immigrants, migrant workers and/or refugees. This sparked a discussion among the participants about dealing with migrants and refugees in both countries: their own ideas about belonging influenced their description of the status of the groups described: who belongs to our society? What characterizes this society? Issues such as exclusion and structural racism were also discussed here. 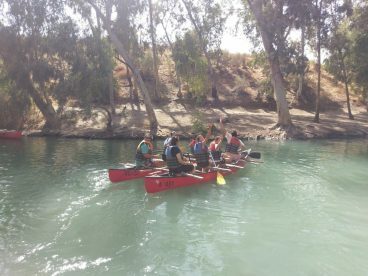 Exchange creates shared experiences: Both the visit to Shefar‘am witnessing its vivid coexistence and the journey to Jerusalem were important milestones in this German-Israeli exchange project. Visiting the Museum and Holocaust Memorial Yad Vashem and meeting a Shoah survivor was an impressive and moving experience for the participants. Socio-political processes that could lead to the exclusion, persecution and murder of certain groups of people became very obvious. In addition to all German participants, some of the Israeli participants visited Yad Vashem for the first time as well and learned about mass atrocities during the Second World War. We will continue this focus on commemorating the Shoah together during the return visit to Germany. The significant role played by the various beliefs in the group became apparent when visiting the Temple Mount with Dome of the Rock and Al-Aqsa Mosque as well as the Western Wall as one of the holiest Jewish sites. For many of the Jewish Israelis it was their first visit to the Temple Mount. 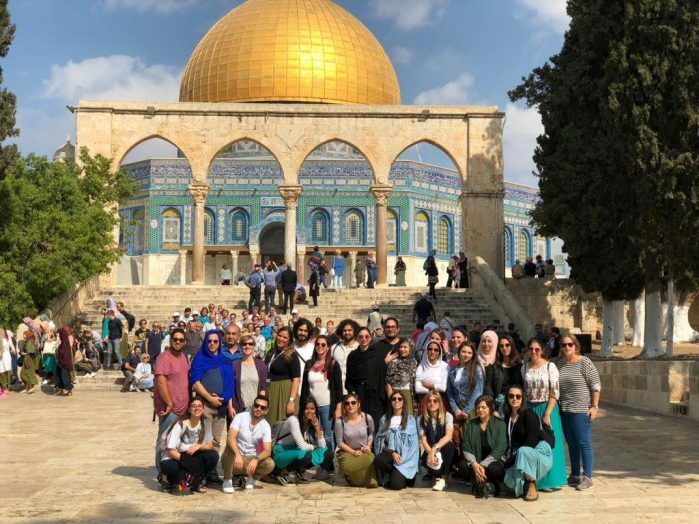 For the Muslim and Druze participants from Israel and Germany, it was a particularly connecting experience to find themselves praying together in the Al-Aqsa Mosque. For the entire group, whether secular or religious, the Temple Mount was perceived as a spiritual peaceful place. In their opinion, it is part of Israel‘s historical, religious, and contemporary political landscape, as well as the vibrant contrast of the Western Wall, at which many Bar Mitzvah celebrations took place at the time of our visit. This multifaceted simultaneously coexistence continued further during the Shabbat celebration of the group on Friday evening, in which the participants of Muslim and Alevi faith were invited to present rituals and prayers of their religion or philosophy of life. To share something special: Many of the participants from Germany have family ties to Turkey or Morocco, were born and raised in Germany, dealing with issues of migration and flight, are involved in refugee projects, have very different attitudes towards their religions, to their being a German, to experiences of exclusion and discrimination. Similar questions and issues of interest are present in the mixed Israeli group, where three participants from the Druze Scouts were part of our group. As different as the participants are, they all appear united in their curiosity to learn new things, to deal with the ambiguities of Israeli and German societies. Irritation is allowed, not suppressed. At the same time, everyone was keen to give enough space and time to the needs of certain group members, as the visit to the Temple Mount has shown. In addition, all are socio-politically active in their region and their communities. They will be able to pass on their experiences, insights and will tell about their new friendships. One aim of this German-Israeli exchange project is to write „a new story [into their] life library“, as one of the participants described. Thus, we just took off, equipped with great expectations and full of ideas the participants from Israel and Germany looking forward to the upcoming return visit of the Israeli group to Germany in March 2019 in Dortmund. The project “Living Diversity in Germany and Israel – Challenges and Perspectives for Education and Youth Exchange” was developed by ConAct – Coordination Center German-Israeli Youth Exchange and the Israel Youth Exchange Authority in close cooperation with the Federal Ministry for Family Affairs, Senior Citizens, Women and Youth. It is conceptualized as a supportive project in the German federal program “Live Democracy!”. The project is running from 2015 to 2019.